Welcome to the official blog of Operation Three-Legged Dolphin (a.k.a. "O3LD"), a humor magazine that is written, published and funded by the students of The College of Staten Island of The City University of New York. Our goal is to publish the work of our student body for everyone to enjoy, with a brand new issue each semester! We publish everything from articles to comic strips, and our humor ranges from the topical, to the thought-provoking, to the just plain silly! 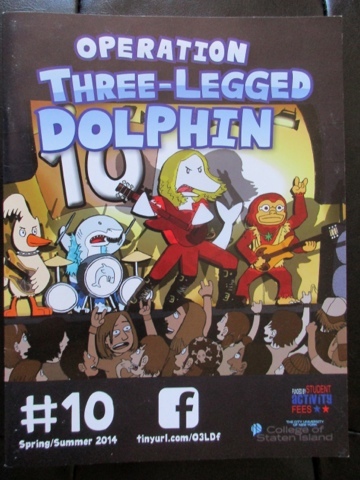 Our tenth anniversary issue of Operation Three-Legged Dolphin is now available for all to see! Its zany depths feature a detailed retrospective of O3LD's dynamic past- including its former magazines and its full character cast. In addition, Issue #10 introduces the contemporary entry of "Punk Sloth Comix," a zine-styled portrayal detailing the life of true punk sloth. Be sure to check it out in stride! contained within this publication are the property of the creators and are protected by copyright law. shared by the Operation Three-Legged Dolphin staff or the College of Staten Island. responsible for the contents of Operation Three-Legged Dolphin. contain material that parents may not find suitable for younger readers. Operation Three-Legged Dolphin © 2007-2015. Simple theme. Powered by Blogger.